Whilst I was speaking at Live Lounge at a church on the banks of the River Tees in Stockton, I looked out the window and thought I saw some giraffe heads in the trees on the embankment below where we were meeting. I’ve never really trusted Diet Coke but it seemed impolite to refuse the offer of a can before I stood up to speak to the assembled group, (I suspect that we shouldn’t call it a congregation because this was an ‘alternative worship’ event!). The evening continued; a pleasant, relaxed and positive experience sharing and encouraging conversation around tables and taking questions on issues of spirituality, the values and influences that shape our lives and the society in which we live. I bade farewell, got in the car and began the long journey home. I think I drove barely 20 meters when together with other vehicles we were stopped. The delay seemed endless; in reality it was probably only five minutes before the aforementioned giraffes appeared. 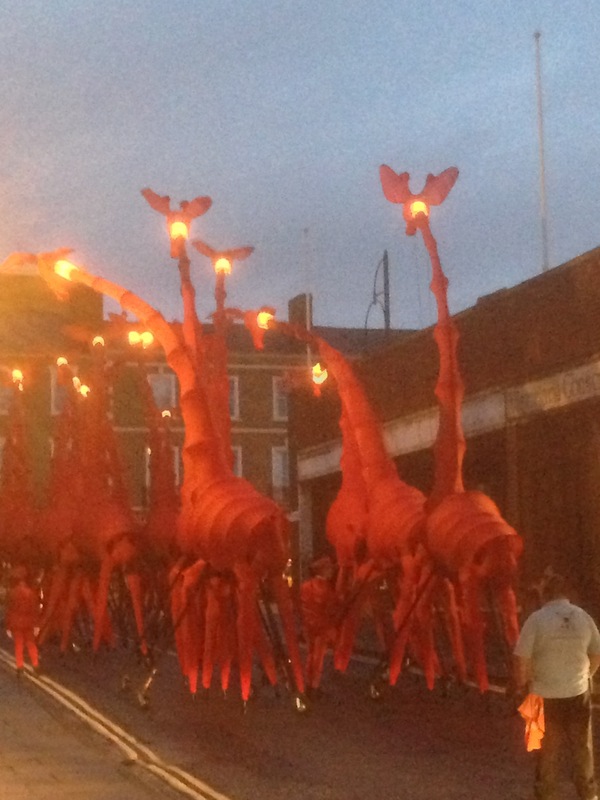 The whole herd, or should I say ‘tower’ of giraffes, about a dozen of them, standing elegant and resplendent in the road before us, awaiting their entrance to the parade and fireworks display that were to conclude a very successful Stockton Riverside Festival weekend. I had to get the iPhone out and take a photo and send an e-mail to Shirley and the rest of the family at home. Can you imagine me ringing and speaking or leaving a message, “I’m sorry but I’m going to be a little late, I am held up in urban Teeside behind a load of giraffes!”. What you do in those circumstances, when after a long day, all you want to do is to get home and be with your wife. I’d left early that morning, driven down to the beautiful Mount Grace Priory in North Yorkshire, met with my closest friend, enjoyed a leisurely lunch and catch up, walked around a small reservoir, made some phone calls, done some reading and further preparation for the evening, contended with a passenger door that wouldn’t shut. Heath Robinson had nothing on the strapping of my sailing jacket and some garden twine to keep the door closed! I was greeted at Live Lounge by two other good friends and then, because people heard I was “back in town”, several folks whom I hadn’t seen for many years came to the event. Subsequent conversations, memories and catch ups were shared. A really pleasant day but I wanted to be home. My first reaction with being confronted by the delay was frustration but very quickly it turned to an awareness and appreciation of the ‘sacrament of the present moment‘. We have this strange notion within Western culture that we can control our destiny, exert enough power and influence, get to grips with time management, take command and determine outcomes. What a load of nonsense. As Woody Allen says, 90% of life is just showing up, that is, most things happen to us and we are just participators in those things. Like the giraffes incident; there’s no way that I could have envisaged encountering them on my way home. Instead of being frustrated, complaining, getting angry or fed up, I took the experiencing and loved every minute of it. It was party time on the streets in Stockton, where for many people there is little cause for celebration and life, for some of its residents, holds little joy or hope. So to be with people of all ages and backgrounds, to share in conversation, easy conversation and much laughter was a real gift. I do like folk from Teeside. I probably shouldn’t say that as a Geordie but I’ve known and appreciated the warmth and welcome and down-to-earthness of people who live in the area. We got to know many of them when we lived in Stockton, a significant number with whom we’ve retained that friendship over twenty five years. The worship leader for Live Lounge was a young woman who I had dedicated as a baby and many years later had the privilege of taking her wedding service. She is a good musician and a great, strong singer. She closed the evening by singing John Rutter’s Celtic blessing Deep peace, which evoked memories of my great parents, at whose funeral services we sang the song. It was tough and challenging living, pioneering and pastoring a church in a rundown area of three council housing and one private housing area but it was good, and formative for my life and ministry. It shaped something within us that, as a family, we look back on with fondness and much appreciation. I always enjoy going back and it was lovely to be on the streets with the people in festive mood. As for the giraffes ,I don’t think I’ll ever encounter them again, well not on Stockton High Street but the memory will live on and treasured for many years.